I’ve started collecting my Mathematical Knitting posts at Sonderknitting, a Mathematical Knitting Gallery. But I’d never done a post about my Probability Scarf. This is not my idea. I don’t remember where I saw the instructions, but they are easy and a lot of fun. 1. Choose six colors of yarn that go together well. Assign them numbers from 1 to 6. I chose leftovers from my Prime Factorization Sweater. 3. For each row, roll a die to decide which color to use. Flip a coin to decide whether to knit or purl. 4. Continue in this manner until you’ve run out of one of the colors. You now have a scarf demonstrating the Uniform Distribution. 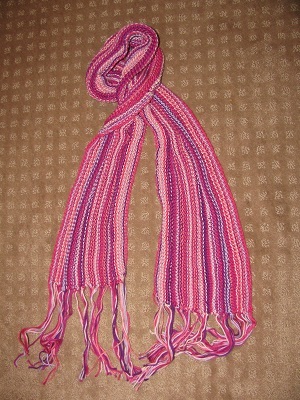 This scarf was fun to knit. It was hard to stop knitting, because I kept wondering what the next row would look like. It occurs to me that it would be fun to do a Probability Scarf using a different probability distribution. You could find a generator based on another distribution (where the colors wouldn’t all be evenly distributed) and use that to decide which color to use. This would be fun if you wanted to use a second or third color just for highlights. Or maybe you didn’t have the same amount of each yarn. Maybe that will be a future project…. This entry was posted on Wednesday, October 7th, 2015 at 11:06 pm and is filed under Knitting, Mathematical. You can follow any responses to this entry through the RSS 2.0 feed. You can leave a response, or trackback from your own site.